Easy to make and great tasting! 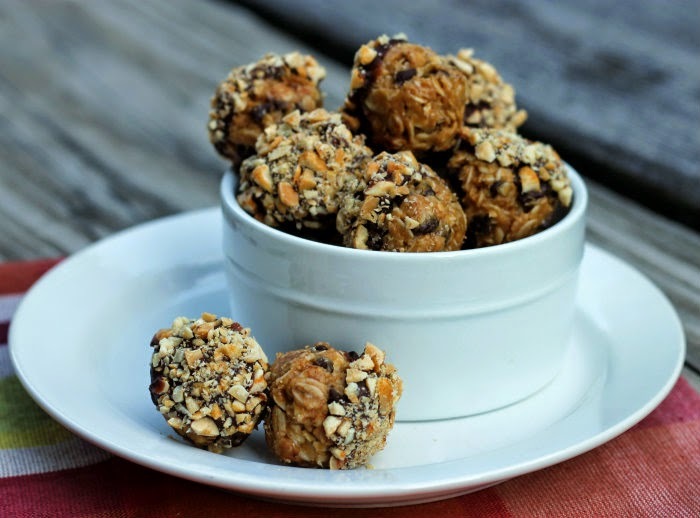 No bake oatmeal and peanut butter balls. I have wanted to make some no bake oatmeal cookies for some time now. When looking for a recipe I found that I liked the ones that were called energy bites or balls. 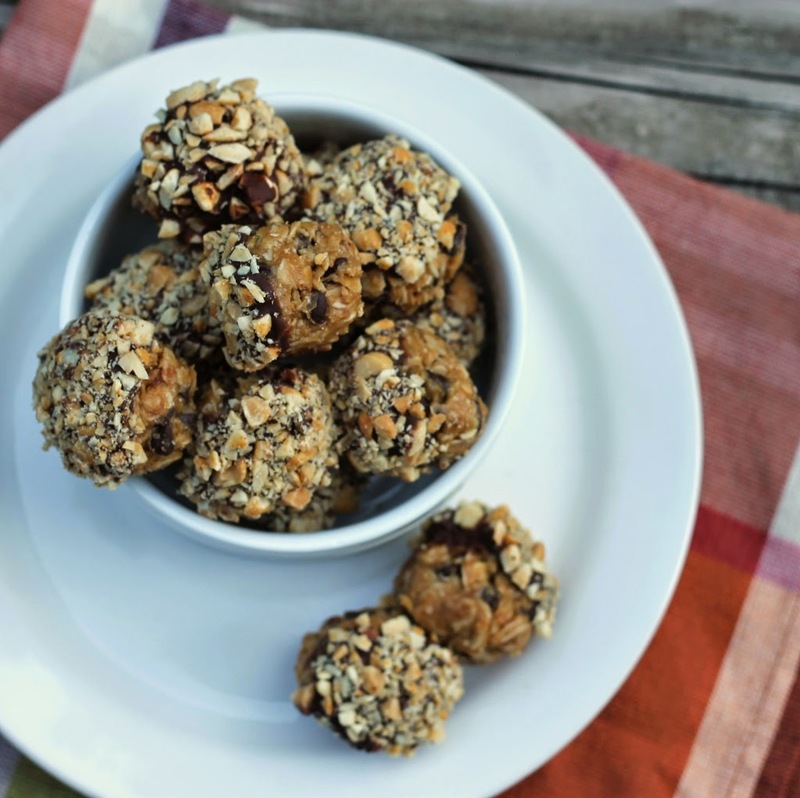 The name energy balls make them sound like they are totally healthy, which I am sure they are much healthier than your average cookie, but don’t let the name fool you they are much tastier than your average cookie that is loaded with sugar. But anyway I have wanted to make these, they sounded so simple to make and I love the peanut butter and oatmeal combination. Most of the recipes that I looked at for this type of no bake cookie were very similar, some had coconut or maybe flax seed, but the rest of the ingredients were exactly me… even the amount of each ingredient were the same. So in mine I decided to change it up a bit, I used a bit more peanut butter and bit less of the honey. I would rather taste the peanut butter than the honey. Plus since I am a huge fan of chocolate I decided to dip them in some melted chocolate and then dip them in some peanuts for a little bit more excitement. I loved how they turned out, they were so simple to make and the extra chocolate and peanuts were a great addition. 1. Blend the Peanut butter and honey in a medium bowl. Add the vanilla and mix until blended in. 3. Cover and refrigerate for at least 1/2 hour. 5. Melt chocolate in the microwave, you may want to put a dab of shortening in the chocolate to thin it a bit. 6. Dip the top of each ball into the melted chocolate and then into the finely chopped peanuts. 7. Set on tray or baking sheet lined with wax paper and set in the refrigerator until chocolate hardens. 8. Store in an air tight container in the refrigerator. These are almost TOO easy to make! I’d be eating them as if my life depended on it. I think this would be a good recipe for me to try because I completely agree with you, I’d rather taste more peanut butter than honey. 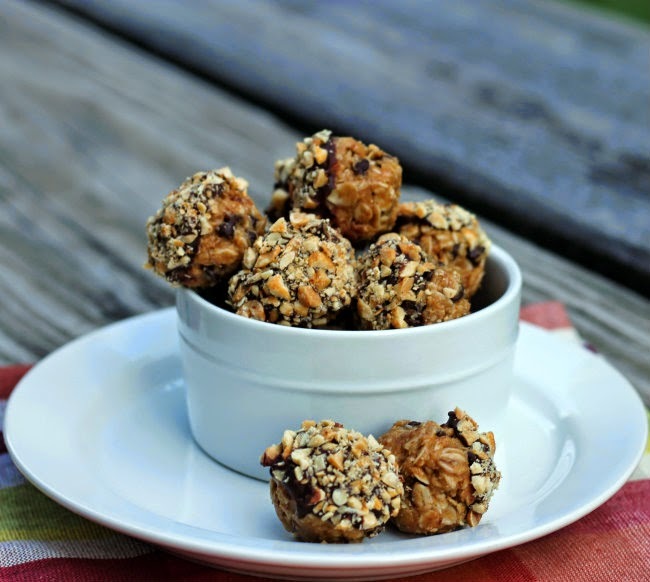 These are so easy to make, and so healthy, I need to try them this week, thanks Dawn!